In the 1870s the railroad was enabling logging operations deep in the East Texas forests, Nimrod became a stop on the Houston, East and West Railroad. The name is Biblical. Nimrod was the grandson of Ham and the Great-Grandson of Noah. In 1905 Nimrod was a lumber camp. Having a sawmill gave it a bit more prestige than most temporary lumber towns, but like the others, it too, faded from history. 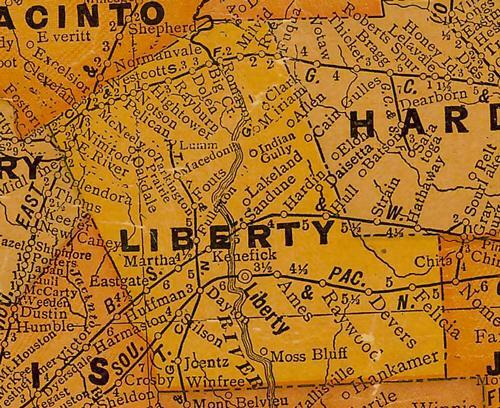 It appeared on state maps as late as the one below (1920s). It is not to be confused with the surviving town of the same name in Eastland County.